What's the story? Why are so many new and old diseases on the radar, and why are they spreading so fast? Is it really all down to people not getting vaccinated as the people in charge would have us believe? But it's not only infected humans that spread disease by flying the friendly skies. The experts think that West Nile virus was probably carried by a mosquito that hitched a ride on an airplane coming out of the Middle East. The mosquito ostensibly bit some birds, who migrated and infected other birds along the way. Then more mosquitos bit the newly infected birds, and then they bit humans, spreading the disease. Since then, up to 700,000 individuals in the US have gotten West Nile, and 1700 have died from it. Similar scenarios have been playing out with a variety of other new diseases, and in fact, there are now 40 more infectious diseases known to medicine than there were just 20 years ago. New diseases surface annually, particularly viruses, which now are emerging at the rate of three to four a year. In fact, viruses comprise two-thirds of recently discovered human pathogens. In addition to Ebola and Zika, we now have Bourbon virus, Heartland Virus (since 1999), Nipah virus, and WIV1-CoV, a SARS-like virus that just surfaced last month.4 Then there's the unfortunately named crAssphage, which regulates gut bacteria. At this time, there are 219 known viruses that can infect people, and 10 times more viruses than bacteria in the body. Another problem is that now more people than ever work in direct contact with animals. It's a direct result of several factors. As the world population increases exponentially, so does demand for meat and other animal products. Thus, increasing numbers of people working in meat-related industries, and these people can contract diseases that the animals carry. Animal products get distributed over wider geographic ranges, meaning that contaminated beef can be shipped to another continent more easily now than ever before. Climate change is allowing insects--especially mosquitoes--that once were restricted to southern tropical areas to now push northward into heavily populated urban areas. And as climate change thaws northern permafrost areas, there is concern that along with the thawing permafrost, a number of viruses and bacteria that have not been seen on earth since the days of the earliest man may also thaw out. Population growth also means that humans are encroaching on territory previously home to animals, and this also increases human exposure to animal diseases. Scientists estimate that mammals carry at least 320,000 viruses not yet identified, and while many of those viruses might not be infectious to humans, some might. "By extending our range, we encounter viruses we wouldn't have otherwise," says Rafael Tokarz of Columbia University Center for Infection and Immunity. "It's the nature of the world we live in now. It's how it is, unfortunately." But all may not be Contagion quite yet. At least some experts say there's no need for alarm because we actually don't have more infectious diseases now than we did before, though it may look like we do. Instead, they say, the "new" viruses we're discovering actually have been around a while. "In a lot of cases, they're not new viruses," Tokarz says. "In the past, [the new virus] was probably something that would be missed or misdiagnosed." In fact, some experts think that newly identified viruses like Bourbon actually have been around a very long time. "It's reasonable to say decades or centuries, for sure, maybe longer," says infectious disease specialist Dana Hawkinson of the University of Kansas Hospital. In the past, doctors would simply tell patients that they had a virus, without necessarily identifying the type of virus. Now, scientists can sequence viral DNA in minutes, so they can recognize each strain of virus and treat it accordingly. This new technology also makes it much easier to find viruses with DNA that doesn't fit the known mold. The fact is that as populations grow, travel more widely and frequently, mix with populations that were previously isolated, and encroach on the environment, they create the conditions that support the rapid and wide spread of infectious diseases. 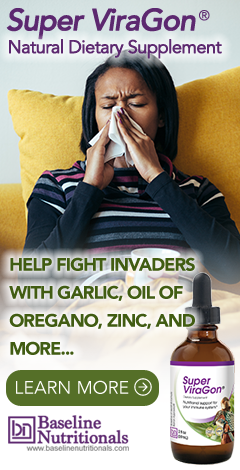 The bottom line for you, as always, is to make sure you do the things that will keep your immune system firing, but also make sure you have a good supply of anti-pathogens on hand just in case. In the first place the "virus" scam is utter nonsense and anybody who falls for "the infectious virus" trick is a sucker. Viruses are not living organisms and therefore cannot "infect" because they cannot replicate themselves. Nor can they be breathed in or swallowed and do the trick. A virus cannot remain viable that way. We have a technical definition for "virus." So if you don't know what they are, then try a "no-seeum" or something else, but stop calling them "viruses!" It makes you sound like an ignoramus. That’s certainly one definition of a virus. But the commonly accepted, scientific/medical definition is: "an infective agent that typically consists of a nucleic acid molecule in a protein coat, is too small to be seen by light microscopy, and is able to multiply only within the living cells of a host." This article is very informative. However I think that the emphasis should be on "no panic". We know that those media which support Big Pharma will use any excuse to talk up a sniffy nose into a global pandemic, indeed we have seen many examples of this over the last decade. The question of immunization needs to be addressed because as far as I know there is still no science behind immunization at all. In addition the fairy tale about the unvaccinated spreading disease needs to be put firmly in its place in the wastebasket. It is known that immunized people "spill" the disease against which they have been vaccinated and may be more to blame. Really there is no substitute for a proper diet and a strong immune system.